For sometime now, I’ve been aching to go back to Sydney. I miss Melbourne too, of course, but I felt that my 3 days in Sydney was just a taste test that left me craving for more. It doesn’t help seeing my Sydney pictures, nor to hear about people planning on going there for the World Youth Day 2008. It specially didn’t help reading about Sydney over at the Lost Girl’s blog. So what is it about Sydney that I miss so much? The ferries.I can spend the whole day just riding the Sydney ferries. I don’t know why but it just feels so good to be commuting from one place to another by ferry. I suppose it’s because we don’t have it here in Manila (or at least not as extensive). Feeling the fresh breeze on your face, looking out and seeing the most beautiful harbour in the world… yes, this is the best way to get around in Sydney. 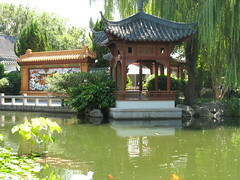 The Chinese Friendship Garden. This is one of the first places I visited in Sydney, and it wasn’t even in my to-visit list. I came up to it while walking from Chinatown to Darling Harbour. Since the admission fee was only AU$6, I thought, why no? It was the best decision ever. When you’re inside the Chinese Friendship Garden, you forget you’re even in a city. All traces off the outside world seem to vanish, save for the sight of a couple of high rises nearby. This is the place to visit after a long day of sight-seeing, as the place is so tranquil. Definitely the best place to wind down and relax. Circular Quay. Everything’s in Circular Quay, there’s no time or space to be bored. There are plenty of places to get a bite or a drink, it’s a transportation hub (the main ferry dock, the city train, busses just across the street), The Rocks just a short walk away. The best part: the buskers. They are street performers that gives “free” shows on the streets. You can never ever be bored in Circular Quay. Sydney Opera House. Of course, the list is not complete without the Opera House. The icon that is known throughout the world as Sydney’s and Australia, is really an awesome piece of architecture. It’s the place to see and be seen, for both tourists and locals, though most of the tourists are loitering around the Opera House steps, the locals are living it up down at the numerous bars that line the Opera Bar. Of course, whereever you may be perched in the Opera House’s vicinity, you have a view of the harbour and the harbour bridge. Watson’s Bay. This may seem odd to be in the list, but there’s something about Watson’s Bay that is simply endearing. The oddest part is that most of the tourists who take the ferry to go there do nothing but eat while waiting for the ferry back. To be different, hop on a Bondi-bound bus and take a scenic ride along one of Sydney’s suburbs. For added thrill, ask the friendly bus driver to drop you off at the cemetery en route. It looks pretty awesome from inside the bus, though I wasn’t able to go down to investigate. Manly. While everyone else says “Bondi,” I say “Manly!” I’ve been to both Bondi Beach and Manly Beach, and all I can say is that Manly has more character than Bondi. Not that I’m dissing Bondi; Bondi is a pretty great place to hang out, but Manly just felt different to me. It starts with the ferry ride from Circular Quay, to disembarking at the Manly Wharf, then walking through the Corso to get to the beach. You see a line of trees, and just beyond, fine sandy beach starts and beautiful blue waters rush in from the Pacific. Mardi Gras. What can I say? 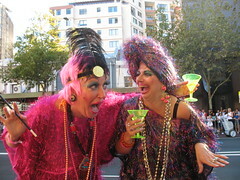 Sydney’s Gay & Lesbian Mardi Gras is simply awesome. It’s actually a month-long event, which culminates with a parade and several after parties on the first Saturday of March. Mardi Gras is not only for the gays & lesbians; when I walked unto Oxford street on parade day, the first group I laid eyes on were actually a family complete with grandparents, grandkids and picnic paraphernalia. People from around the world actually fly in to Sydney to participate in the parade, watch it from the sidelines or simply just to party. Double decker trains. I am just amazed by their trains. I was surprised when I first saw their trains approaching the Airport station. I thought it was just the Airport Express that’s double decker, but it turns out all the trains in the Sydney City Rail network are huge. Lovely! I dunno, I’m just a sucker for trains. Yum Cha at Chinatown.Almost every guidebook recommends trying out the Yum Cha in Sydney’s Chinatown. Always eager for dimsum, I decided to give myself one last treat before I left Sydney. I went inside the first Chinese restaurant I saw and was please to see that it was filled with Chinese families having lunch. I intially felt uncomfortable eating solo in a place where all table were occupied by 2 or more people, but once I took a bite of my first dimsum, I quickly forgot about shame and took as many dimsum I can eat. It was expensive, but so so worth it. I hope I could visit the Australia in the future and visit those places you mentioned and see their culture as well. Love that Opera shot with the moon. Hanep! i’m sooo hating you… because i envy you lol it’s my passion to travel the world, i just can’t do it yet. i still have to graduate from college lol so far, i’ve only gotten around to visit SE asian countries. thanks for sharing your adventures! Ferdz: I’m sure makakpunta ka rin someday! Be sure to go to Sydney and Melbourne, both are really vibrant cities. Yay for new travel blogs to read!! Those girls are super cute! hi! i will be visiting sydney for world youth day,. can you suggests tours and places of interest to visit?? thanks.. your help would be very much appreciated!!! I do miss Sydney too and all the 10 things you miss! I also miss the walks and the cool weather! 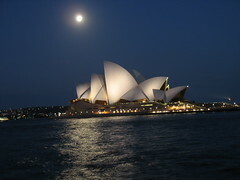 I’ve just been there last March-May 2009… Next time next time…Canberra, Melbourne, Brisbane perhaps hahaha!